Not long ago, when a dog was diagnosed with lymphoma, one of the most common forms of canine cancer, pet guardians had little reason to hope for a cure. With success rates of less than 2% and remission times lasting on average just over 12 months, current chemotherapy protocols have not been able to offer much promise of long term success. 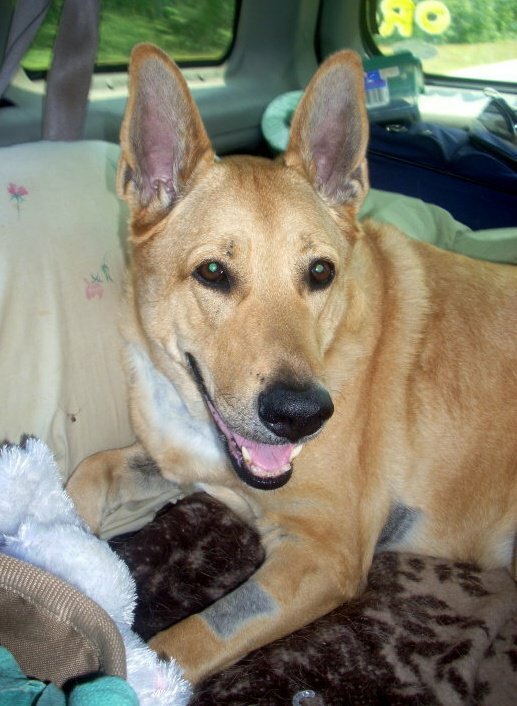 But, a new method of treating dogs with lymphoma is changing all of that. 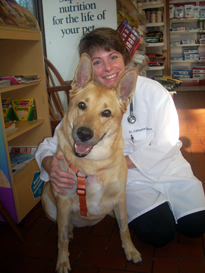 Angel poses with Dr. Catherine Garon from Riverlands Animal Hospital in LaPlace, LA, where she received part of her treatment. Although bone marrow transplants (BMT) have only recently become available as an accepted treatment for dogs, they actually started being performed in a research setting about 30 years ago. Because of the amazing similarities between dogs and humans when it comes to cancer, all of the current human transplant protocols were actually developed using dog subjects. 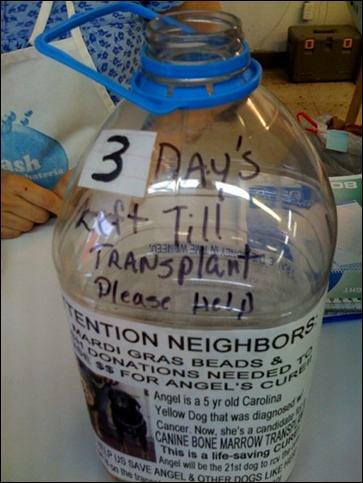 In fact, 95% of transplant procedures performed on humans were developed using dogs first. So, it was only a matter of time until this groundbreaking procedure made it full-circle back to the species that originally helped develop it. To understand more about why BMT is so useful in cancer treatment, it is helpful to understand how chemotherapy and radiation therapy work in animals and humans. As explained by the National Cancer Institute, “Chemotherapy and radiation therapy generally affect cells that divide rapidly. They are used to treat cancer because cancer cells divide more often than most healthy cells. However, because bone marrow cells also divide frequently, high-dose treatments can severely damage or destroy the patient’s bone marrow. Without healthy bone marrow, the patient is no longer able to make the blood cells needed to carry oxygen, fight infection, and prevent bleeding.” Because of this risk to bone marrow function, canine patients often receive lower doses of chemotherapy or radiation than needed to completely wipe out all of the cancer cells, and as a result, the cancer usually comes back. Bone marrow transplants eliminate this problem however, and make it possible for patients to receive very high doses of chemotherapy and radiation, thereby making it more likely that the cancer will be eradicated from the body. To qualify for a BMT, dogs can be diagnosed with either B-cell or T-cell lymphoma, but they must weigh at least 10 kg and be in clinical remission. However, that still doesn’t make a dog a good candidate. For dogs who have serious co-existing conditions or co-morbidities such as Cushing’s Disease, kidney or heart disease, the BMT process would likely put undue stress on their system, creating an unacceptably high risk for them. Luckily for Angel, she was young, strong, and very healthy in every other respect. And after a bone marrow aspirate confirmed that she had B-cell Lymphoma, the type of Lymphoma that responds most favorably to treatment, she was well on her way to becoming an ideal candidate for the transplant procedure. Now, it was just a matter of achieving that all-important clinical remission. Once Angel’s chemotherapy protocol ended, it was time to begin preparing for the BMT. Similar to the treatment that most human patients with B-cell lymphoma receive, canine BMT’s involve an “autologous”, or “self” transplant, meaning that a separate donor is not needed. Instead, the stem cells are taken directly from the patient being treated. To facilitate this process, Angel had to first receive very high dose chemotherapy about 10 days before the BMT, to destroy as many remaining cancer cells in the body as possible. She then received a drug called Neupogen, which drives the stem cells from the bone marrow into the peripheral blood where they can be harvested by a special piece of equipment called a leukaphoresis machine. Angel hooked up to the leukophoresis machine, which harvests stem cells from the bone marrow prior to the transplant procedure. The harvesting procedure itself took six hours and was done under general anesthesia, as all of Angel’s blood was run through the leukaphoresis machine. She then underwent total body radiation, with the goal of killing any remaining cancer cells in the body. After all of this, she was finally ready to receive the transplant. Using a tube called a jugular catheter, the harvested stem cells were reintroduced into her bloodstream in a process similar to receiving a blood transfusion. Miraculously, these stem cells automatically know how to find their way back to the bone marrow and immediately begin their important work of rebuilding healthy blood cells. Patients typically remain in the hospital for two weeks following the procedure to recover, and blood samples are drawn and checked regularly to confirm if the transplant is working. Blood transfusions are sometimes necessary when blood platelets drop too low, and this was true in Angel’s case. But, after a single blood transfusion (thanks to a wonderful canine blood donor) and 4 weeks of recovery time, Angel’s platelets returned to a healthy range, and her transplant was considered a success. By the time the patient is ready to go back home following the BMT, they are on zero medications, and officially cancer-free. But, that doesn’t mean the recovery process is complete. Lingering effects from the chemotherapy and total body radiation include GI disturbances and significant hair loss. The most pervasive after-effect of treatment however is tiredness, which can last for up to 1-2 months. So, if such a highly effective treatment exists and could potentially save the lives of thousands of dogs each year, why aren’t bone marrow transplants becoming a standard treatment protocol for dogs with lymphoma? The primary reason is that there are few medical facilities capable of offering this treatment option because they lack both the equipment and expertise. 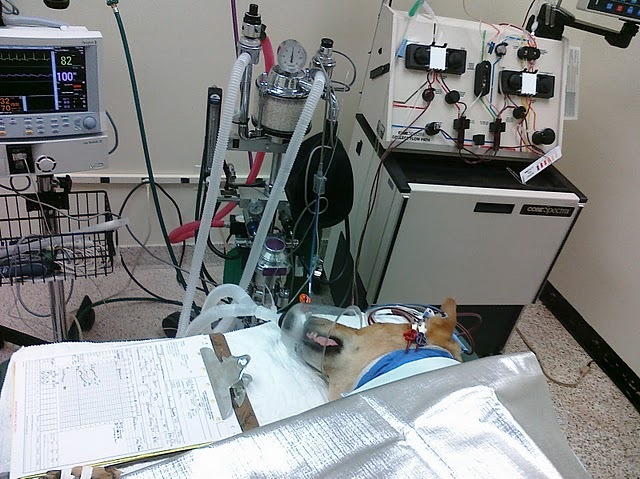 North Carolina State University’s Veterinary Teaching Hospital is currently the only academic facility in the country performing BMT’s in a clinical setting with staff who have extensive experience using this technique. 27 dogs have already been treated at their facility, and their schedule is currently booked into January. NCSU’s Dr. Suter is the hands-down expert in performing BMT’s on dogs, and the university has also hired the nation’s first BMT Fellow who will be working with Dr. Suter for the next year to learn all about canine BMT, so they can begin transplanting even more dogs. Although there are a few private practices across the country that say they can perform the procedure, the fact is that they do not have the expertise or experience required to really make it a viable option for pet guardians. As more cases are documented however, and as additional vets gain experience using this technique and more facilities add leukophoresis machines to their cancer treatment centers, the hope is that BMT’s will become much more widely available in the next 3-5 years. Angel's bone marrow transplant was made possible through the generosity of many friends and pet lovers who donated to Save-An-Angel. The second, and perhaps more obvious, reason that more pet guardians are not pursuing bone marrow transplants for their canine family members is the high cost of this procedure, which averages about $14,500. If this sounds astronomical, it’s really quite a bargain. For humans, a BMT can require up to 6 months of hospitalization and care, costing between $100,000 and $250,000 dollars. While the goal is to eventually bring BMT’s for dogs into the $10,000 range, this is still a lot of money for most families, even if pet insurance covers a portion of the expenses. For Angel’s family, coming up with so much money in just a few short months was very daunting, but also led them to a new calling. To help raise money for Angel’s treatment, they established a website called Save-An-Angel.org and worked tirelessly to raise the $16,000 needed for her transplant. “I was truly shocked by the kindness of people and their willingness to help us save Angel’s life,” says Kristie. “My fear was that everyone would shun us, but the majority of people that we spoke to showed us nothing but love.” Motivated by the many dedicated pet owners that they encountered who were facing similar situations and encouraged by the success of their own fundraising efforts, they eventually decided to turn Save-An-Angel into a full-fledged non-profit organization to educate and provide financial assistance for dogs with lymphoma who could benefit from a bone marrow transplant. Save-An-Angel is currently hoping to have official non-profit status by the end of the year. Today, Angel is back to her old self — full of energy and cancer-free. She’s also developed new-found confidence. “Before Angel was diagnosed, she had a touch of anxiety,” says Kristie. “But this experience has given her infinite strength, and nerves of steel.” Angel is back to enjoying long walks and playing with her brother Romeo at the park, and the hair that thinned so much during treatment has already grown back. Along with her parents, Angel is now on a mission to educate others about the potential benefits of bone marrow transplants for dogs through Save-An-Angel and hopes to continue inspiring others with her success. If your dog has recently been diagnosed with lymphoma and you are interested in finding out if a transplant is right for your dog, contact the BMT Unit at North Carolina State University as soon after the diagnosis as possible. Currently, the procedure is only being performed every 2-3 weeks, so it’s important to have your dog added to the schedule as early as possible. Call 919-513-6272 or CLICK HERE to visit the NCSU Bone Marrow Transplant Unit website for more information. To learn more about Save-An-Angel and to find out how you can get involved, visit www.save-an-angel.org. 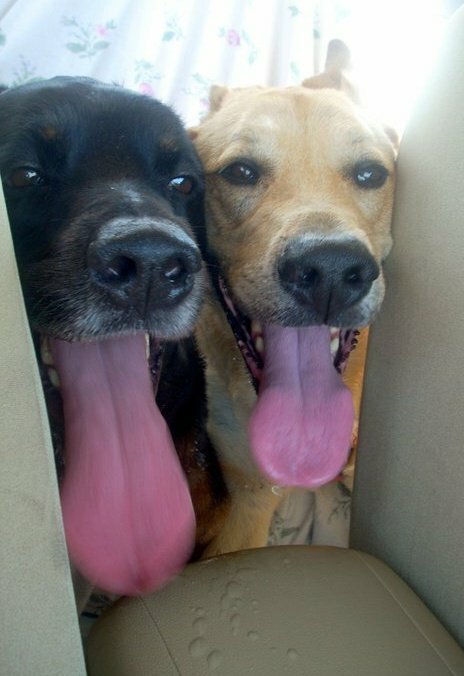 Romeo and Angel are looking forward to many more happy years together now that Angel is cancer-free. Don’t be scared to ask for help. You may be surprised at how many amazing people there are out there that WANT to help you! There is no way that we could have saved Angel’s life on our own, it was a community effort. You might even make some new friends in the process! STAY POSITIVE – no matter what! When you are stressed your dog can feel it, so try to make sure that they feel happiness and love radiating off of you. When Angel was going through chemotherapy I noticed that she was becoming increasingly stressed on our ride to the vet. Once I started to relax and smile or talk in a soothing voice she would relax and I would too! Worrying accomplishes nothing. Love unconditionally, be consistent, act quickly, be persistent and KNOW that where there’s a will there is always a way! Be prepared to focus the majority of your time, money and energy into getting your dog well. They won’t get better overnight, but the benefits far outweigh the sacrifice. Focus on being happy! This entry was posted in Cancer Treatments, Diet & Nutrition, News, Research News and tagged angel sullens, b-cell lympoma in dogs, bone marrow transplants, canine cancer, canine cancer research, canine lymphoma, dog cancer, dr. steven suter, North Caroliina State University, save-an-angel.org. Bookmark the permalink.